Mackinac Bridge Authority (MBA) Executive Secretary Bob Sweeney said a combination of factors contribute to those numbers. Crowds were so large that the bridge authority extended the window for people starting the walk from the usual 11 a.m. to nearly 2 p.m.
Gary Engle of G-Man Entertainment, who has been master of ceremonies for the bridge walk for 25 years, believes the big numbers included many first-time walkers. His unofficial “polling” at the starting line showed 20-25 percent of one of the biggest crowds he’s ever seen were new walkers. However, another big segment of walkers are families who have made the walk a tradition. Sweeney said that in addition to his staff and local volunteers, law enforcement and military personnel help make sure the event ran smoothly. This year, the walk had assistance from the Michigan State Police; the U.S. Coast Guard; the St. Ignace and Mackinaw City police departments, the Mackinac, Emmet, and Cheboygan county sheriffs’ departments; the Department of Homeland Security; the Federal Bureau of Investigation; the Sault Ste. Marie Tribe of Chippewa Indians; and the Michigan National Guard. 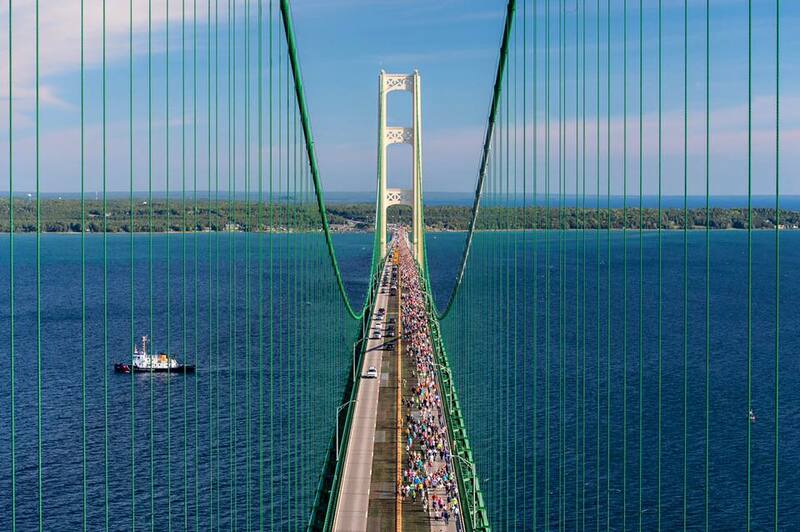 Share the post "Thousands cross Mackinac Bridge at Labor Day walk"
Categories: Activities, Featured, and Mackinac County.